Permanent Secretary in the Ministry of Finance Mr. Laurie Lawrence speaking at the seventh annual Anti-Money Laundering/Caribbean Financial Action Task Force Seminar. 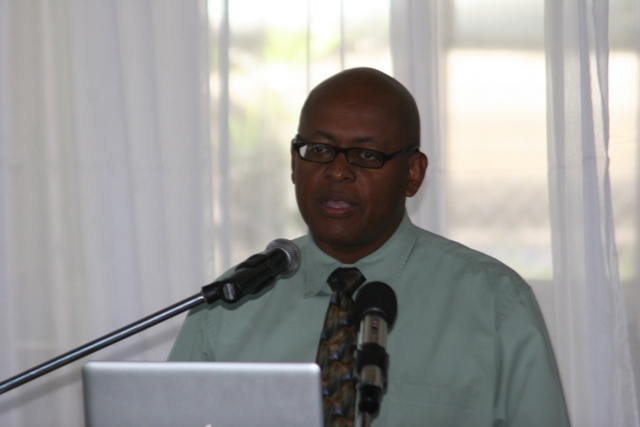 This is according to Permanent Secretary [PS] in the Ministry of Finance Mr. Laurie Lawrence who was at the time addressing representatives from the financial sector at the seventh annual Anti-Money Laundering [AMT]/Caribbean Task Force [CFT] Awareness Seminar. In the absence of Nevis’ Premier and Minister of Finance the Honourable Joseph Parry, Mr. Lawrence spoke of the NIA’s commitment towards to the offshore sector and its plans to strengthen the public and private sectors. “From what I’m seeing, the future is bright for improved cooperation so that we could continue to work together as a team to advance the interest of Nevis in the offshore arena,” he added. “We have improved regulatory infrastructure [and] we have done a tremendous amount of work in improving our standards,” he said. With the continued aim of “eliminating negative perceptions and maintaining the integrity of the financial system,” PS Lawrence highlighted his ministry’s plans to continually host financial seminars. “Seminars such as these become even more important in providing industry players and government with a forum in which we can become more informed on developments and standards of best practice and where practitioners can share experience which will ultimately lead to improved business practice,” Mr. Lawrence said.